We are often approached for advice and recommendations with regard to building defects and preventative maintenance. With a façade specialist qualified to CEng MICE MIStructE MSAICE, as well as a MEng qualified Senior Mechanical Engineer, we are able to offer authoritative and knowledgeable appraisals and recommendations for the best course of action. 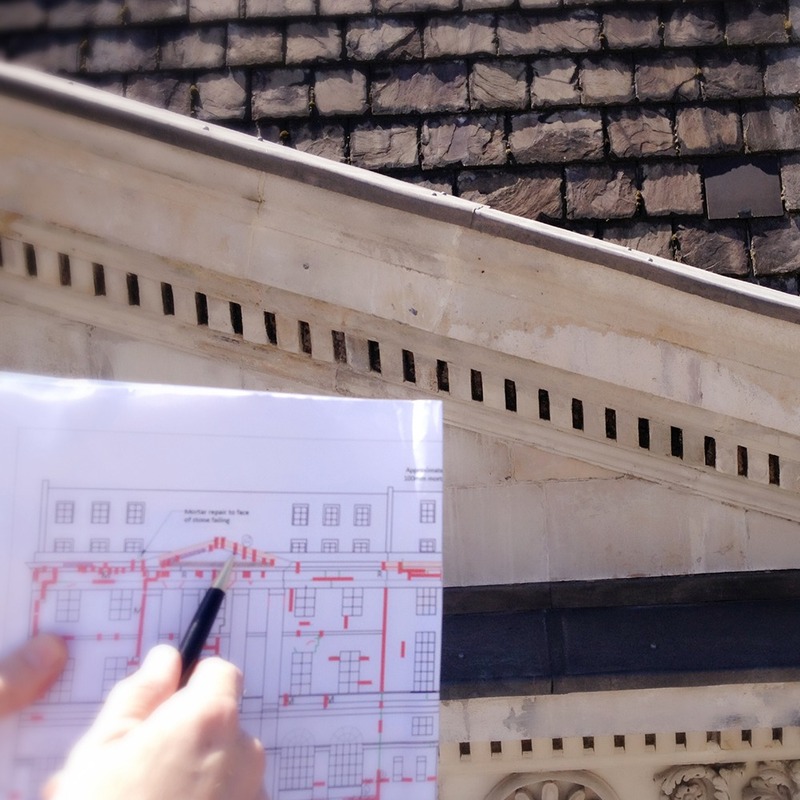 Whilst facade surveys are our speciality, we also bring our expert knowledge of structural engineering and historic materials to bear on defects relating to the whole structure, assessing the extent and cause of any damage before providing an analysis of the most viable solutions. We perform visual building survey from MEWP wherever possible and, if necessary, carry out more invasive investigations of properties. Undertaken with the assistance of our Restoration teams, such investigations enable us to determine the most appropriate methods for repairs, alterations or any other modifications as specified by the client. At Thomann-Hanry®, we can also laser scan façades to produce precisely accurate elevation drawings prior to the building survey, as well as carrying out testing to the property and its materials. Our partnership with glass-metal façade specialists NeroQuom® also enables us to offer equally meticulous surveying capabilities on modern architectural structures. The process starts with a detailed survey and analysis, including spot testing and sampling of the most appropriate remedial products and techniques for the substrates in question. Specifically designed for cleaning, repair and renovation of modern façades, Thomann-Hanry® now offer a range of industry-leading products which comply with all relevant international standards, norms and environmental policies. During the washing and inspection of the building, we record all visible defects with our bespoke survey software. A digital façade drawing is then produced, including a detailed schedule of defects and before-and-after visuals based on using our recommended products and restoration techniques. Our 3D modelling and CAD capabilities offer even greater scope for a more thorough and robust report. If we are the appointed contractor, our Engineers are an integral part of our team – if not, they can act independently. In either case, they provide a vital resource to ensure works are completed to the best possible methodology and most appropriate specification. Pre-contract consultation and specification development. Complete defect and condition surveys.